Since we grow big, beautiful poinsettias in our greenhouses, we’ve given lots of information about them in our “What We Grow Here” section. Click here to read more about their stages of growth. The poinsettia is not a poisonous plant. 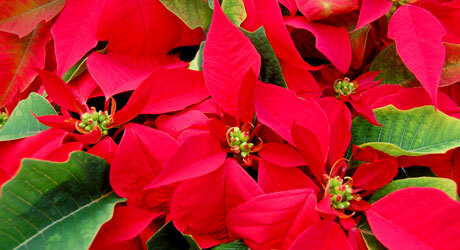 Research at a major university has proven that the poinsettia is not lethal to humans or pets. According to the American Association For the Prevention of Cruelty to Animals (ASPCA) eating poinsettias can produce gastrointestinal tract irritation, but no serious symptoms. If a pet is elderly, ill or very young, take extra precautions to avoid possible problems. Poinsettias (as with all house plants) should be kept out of reach of small children since varying degrees of discomfort may be experienced if plant parts are ingested. When the leaves or stems of the plant are broken off, the plant can ooze a milky sap that may irritate skin. Payne’s proudly grows poinsettias in our greenhouses beginning each July. Click here to see how they progress from “starts” to finish. Here’s how to keep your Payne’s holiday poinsettia beautiful long after Santa has gone. Place in a location where there is a lot of natural light — a little direct sun is good, but not necessary. Avoid hot or cold drafts and excess heat from appliances, radiators, wood stoves or ventilating ducts. To prolong the bright color of the bracts, temperature should not exceed 75 degrees during the day or 70 degrees at night. Water thoroughly when the soil surface is dry to the touch. Don’t keep the soil wet, just moist, and never let the soil become bone-dry. Also, remember to discard excess water from the saucer. Want to try to reflower your poinsettia next year? If you follow these directions very carefully, it is possible to have your Payne’s poinsettia in full glorious bloom again in time for next Christmas. FEBRUARY-MAY: Color begins to fade; place near sunny window and fertilize with water soluble plant food. LATE MAY: Repot into larger container using a prepared potting mixture. Continue to fertilize and water as necessary. Move outside into semishade. Prune back stems just under faded bracts. LATE AUGUST: Take inside. Prune back stems again, this time by 1/3 to 1/2. Place in bright light; a little direct sun is OK. Water as needed. Fertilize regularly with 15-30-15 or similar high phosphate fertilizer. DECEMBER 1: Limit light to 10 hours per day maximum! Put in a dark place (no lights) from 5 p.m. to 7 a.m. Continue to water as necessary and fertilize regularly. If this procedure doesn’t work out, just come back to Payne’s — we’ll have more beautiful poinsettias for the holidays next year!